Sadly, lying has become as American as an apple pie that you said was homemade but is actually from the farmers' market. People lie at work and they lie to their families and partners. In fact, 73% of "people surveyed who'd been in a relationship for at least a year admitted to lying to their partners in order to maintain their healthy romantic relationship," according to a new study from Superdrug Online Doctor. In addition, about 70% said they have not confessed a big lie to their partners, meaning many relationships are sitting on a virtual grenade. Plenty of our daily deceptions are little white lies. Complimenting your partner's horrendous new haircut or feigning interest in your significant other's job won't destroy your relationship. Actually, these kinds of lies can even help you avoid bickering. It's the whopper lies that cause problems, and lying about debt sits near the top of the list. 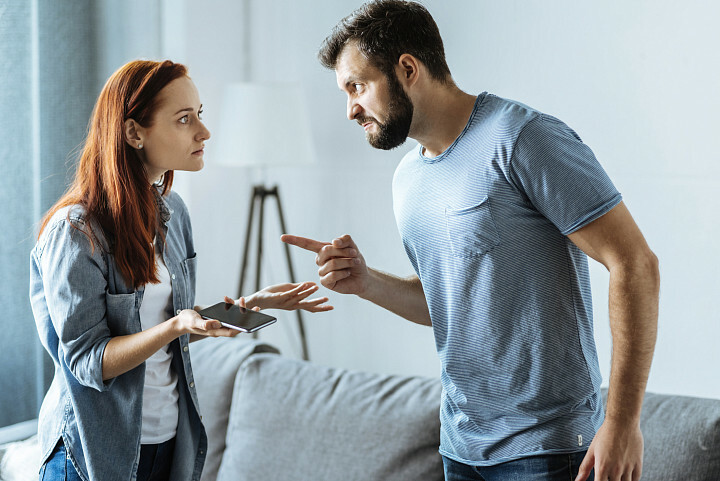 About the same percentage of men (16.2%) as women (15.2%) surveyed said that they have lied to their partner about debt. So, why do we deceive the people we love about our debt? Lying about money can lead to fights. Image source: Getty Images. Some lies are told to protect your partner from a hurtful truth. In these cases -- while confessing is the right thing to do -- not telling the truth does not impact the liar's satisfaction in the relationship. For example, hiding the frequency of alcohol consumption (while dangerous to your health) left the non-confessor unsatisfied in their relationship only 11.1% of the time, according to the survey. People who didn't confess infidelity were unsatisfied 29% of the time. But the people who were not honest with their partner about their debt level reported being unsatisfied 42.9% of the time. It makes sense. If it's weighing on your conscience, you can end an affair or seek help to address your drinking, without your partner ever catching on. It's much harder to do that with debt. Sure, you can perpetuate the lie and keep it going. Remember that 57.1% of those lying about debt said they're satisfied in their relationship. But eventually, lying about your financial situation will come back to bite you. There are numerous situations in a relationship where couples have to mix their finances, even if they generally keep them separate. Whether you rent or buy a place to live, there will be at least a credit check and, in the case of a mortgage, extensive financial scrutiny. The same is true if you try to get a car loan, buy life insurance, or even apply for a credit card. Lying about debt makes having a satisfying relationship difficult not just because of the guilt you feel about lying, but also because of how hard of a secret it is to keep. It's better to come clean, which you should do with a plan. You don't want to just tell your partner over dinner, "Oh, by the way, I have $32,000 in credit card debt," or "I have substantial student loans I never mentioned." No matter what your debt situation is, first you must figure out how you plan to address it. In a relationship, your debt may not legally become your partner's debt, but it certainly impacts your partner's life. If you have to cut back your spending or take on a second job to fix your situation, your significant other will feel the effects. It's best to be honest and involve your partner in your efforts. Be proactive and admit your past transgressions while showing that you're going to do better going forward -- not just that you want to be better, but that you have a specific plan.